The early growth and development of John Ball Park was directed by Wencel L. Cukierski (1869-1926), named Superintendent of Parks in May 1898. Cukierski began working for the Parks Department in 1892 as a seasonal employee until he was given charge of the greenhouses and landscaping at John Ball Park. Under Cukierski's direction, the greenhouses steadily grew in size and production, providing flowers and plants to other city parks, as well as to John Ball Park. His work at the park brought him to the attention of the Parks Commission and led to his appointment as superintendent. 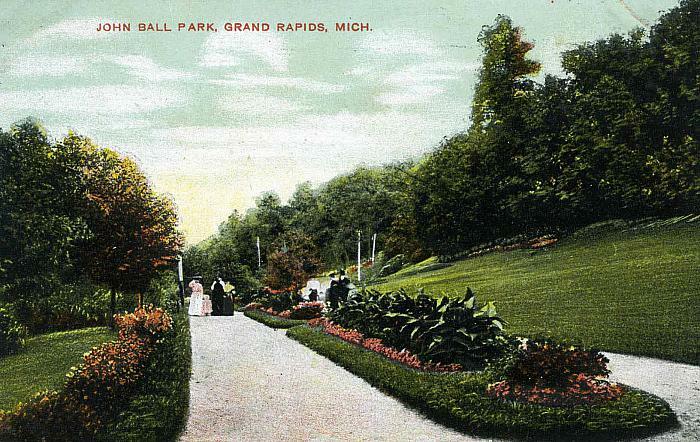 In addition to numerous large flower beds, John Ball Park was spelled out in flowers at the foot of the hillside and a floral sundial, seven feet in diameter, was located nearby. Another bed featured the crossed flags of America and Cuba surmounted by an American eagle. A large floral arch in front of the conservatory was a regular feature of Curkierski's spectacular displays in the park. 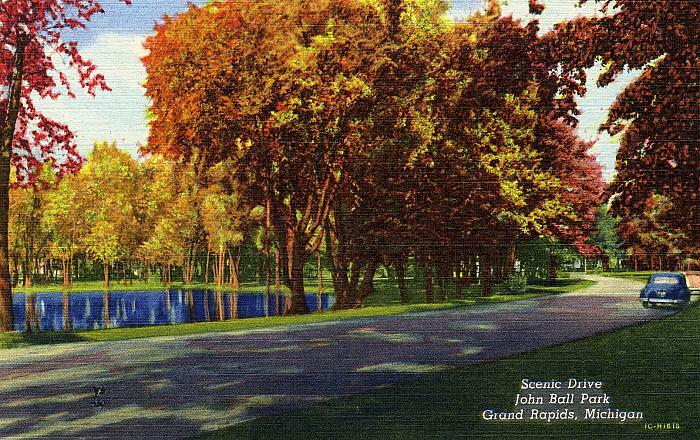 John Ball Park was the jewel in Cukierski’s crown as Superintendent of Parks – but also an eventual source of political dissatisfaction. He laid out paths, garden beds, floral plantings, and designed ornamental bridges, trellises and arbors. Under his guidance it was a fine example of the romantic-era of park design – providing a beautiful place for citizens to stroll and contemplate nature. Eugene V. Goebel (1872-1946) came to Grand Rapids as a boy of thirteen years when his parents emigrated from Germany where his father had served as gardener on the estate of Count Otto von Bismarck, Chancellor of Imperial Germany. Goebel began working for the city of Grand Rapids in 1891, and three years later was named Superintendent of Oakhill Cemetery. 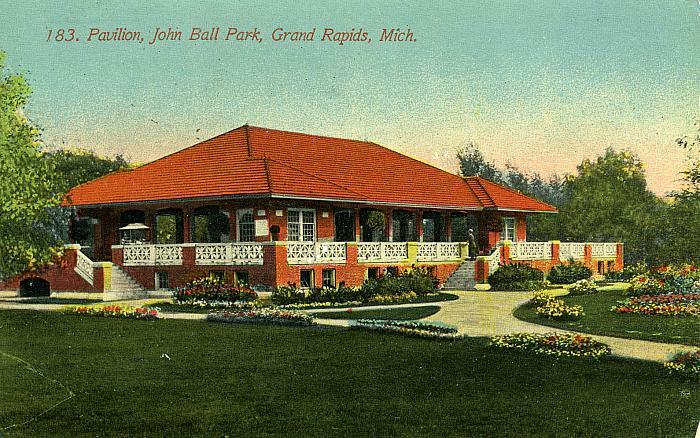 One of Goebel's first duties as Superintendent of Parks and Cemeteries was to oversee the construction of the pavilion in John Ball Park. With the addition of the McNamara property to the park in June 1908, Goebel now had a large expanse of flat land to work into the overall park design. 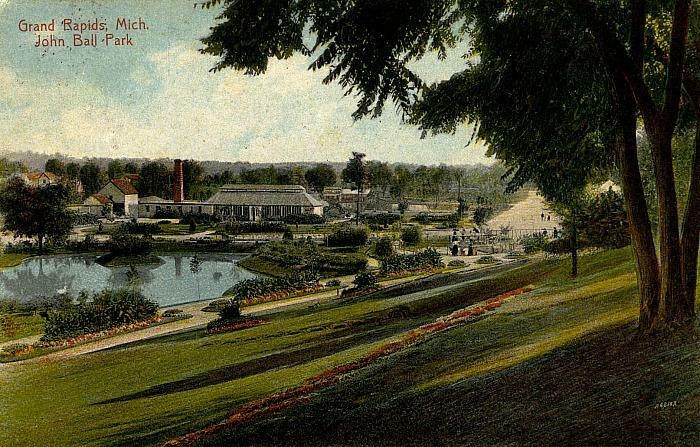 He transformed the park from the highly stylized and relatively passive design of Cukierski to a more naturalistic country park design in the tradition of Frederick Law Olmsted, incorporating features for active recreation. The spring of 1914 saw between 8,000 and 10,000 trees and shrubs planted in the park as the final phase of the redesign. In place of the large formal flower beds and elaborate floral designs favored by Cukierski, Goebel used native roadside and field flowers to provide color. 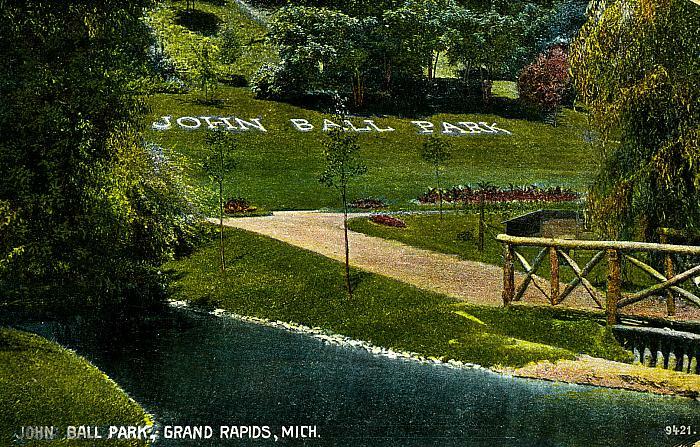 The design of John Ball Park today is largely that completed by Eugene Goebel. His original plans initially included a large lake to the east of the pavilion, but due to lack of funds only the ponds which exist today were constructed. 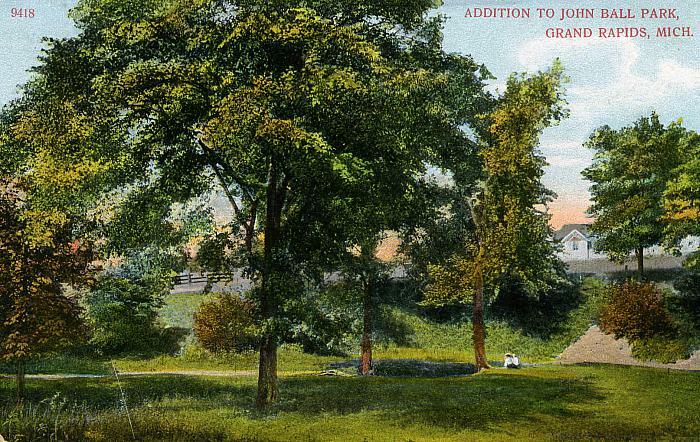 The location of the playground south of the pavilion was part of the 1910 design, however the equipment is modern.. With the exception of a number of elms lost to Dutch elm disease, hundreds of trees planted under Goebel's direction grace the park today. 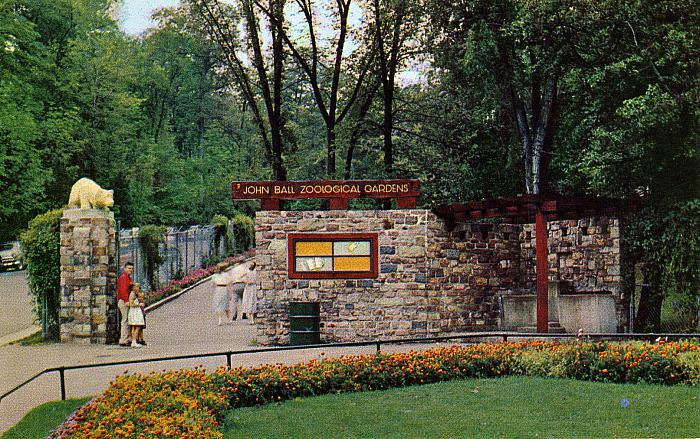 The zoo at the park grew from the menagerie that began with a pair of rabbits in 1890; the following year more rabbits, an eagle, owls, hawks, raccoons, squirrels, and a woodchuck were included. Late in 1891, the collection increased with the donation of two deer, the gift of Mayor Edwin F. Uhl and Alderman Isaac M. Turner. Alderman Turner boarded the deer in his barn until a pen could be constructed in the park. Chickens, guinea fowls, a pair of peacocks and squirrels joined the deer and rabbits in 1892. Frederick C. See came to Grand Rapids to assume the position of Parks Superintendent in 1948. That same year more than five hundred West Side residents signed petitions asking that John Ball Park be restored to its former glory. Specifically cited was the disappearance of the swimming pool, the removal of the play equipment, the absence of nets at the tennis courts, and the need for a play director. Under See’s direction, planning began for a massive improvement program for the city’s parks, including John Ball. 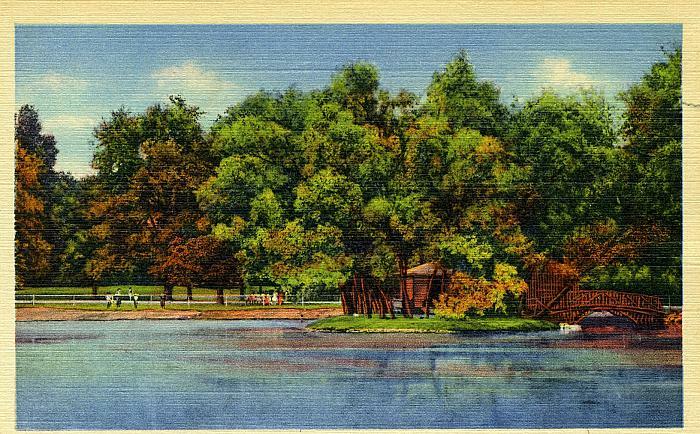 In 1949, a new building for winter skating, picnic and summer play activity was constructed on the shore of the north pond. Within the next three years, playground equipment was reinstalled, the hilltop picnic area was improved, and the zoo was reopened. 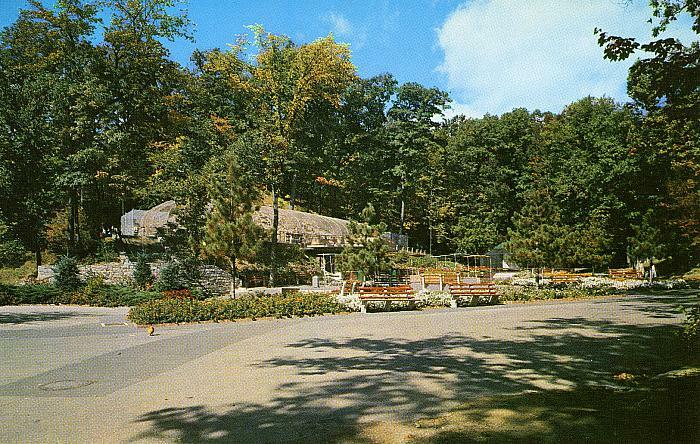 The first parking lot was constructed in the park in 1951 near the skating/picnic shelter. In 1963, the golf meadow gave way to a second parking lot east of the pavilion. Monkey Island (1949) was the first new exhibit constructed. 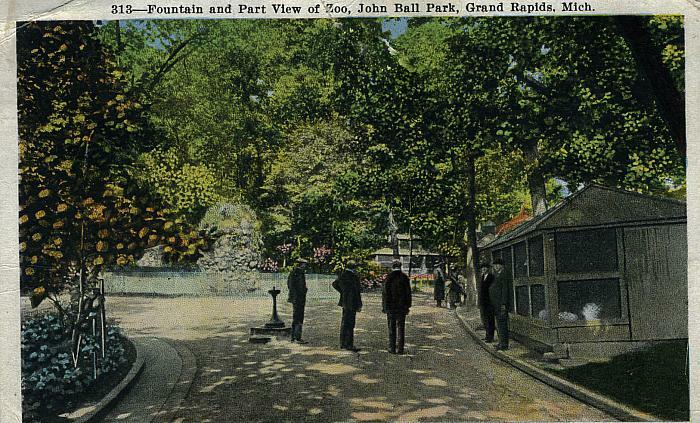 As part of the construction of a new entrance in 1952, spring water from the last of the grottoes in the park was redirected to water fountains and a tap. 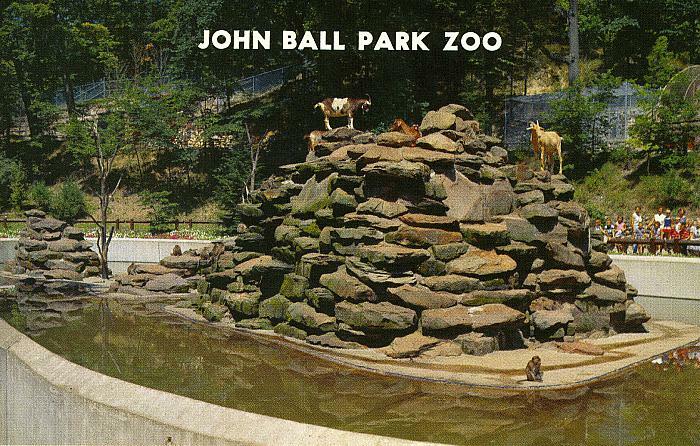 That same year, the waterfowl and water animal exhibit, defined by a concrete and fieldstone wall with iron railings, was completed, new cages for foxes, badgers, coyotes, and other small animals were started, and John Ball Zoo was renamed the John Ball Zoological Gardens. John Ball (1794-1884) is memorialized by a bronze figure of himself seated on a granite bench with two children. The figures of the children were modeled by Virginia and Albert Ellis Ball, great-grandchildren of this Grand Rapids pioneer. Created by the noted sculptor Pompeo Luigi Coppini (1870-1957) from a design by Gertrude Van Houten of Grand Rapids, the statue was dedicated in August 1925. 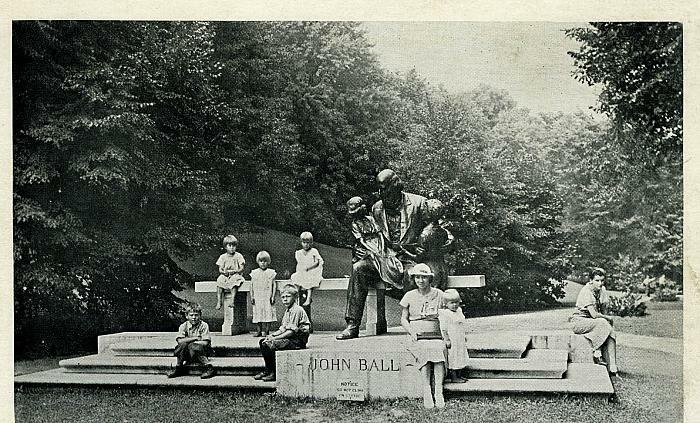 Generations of children have posed for photographs beside Albert Ellis and Virginia on John Ball's lap. The statue is individually listed as a Grand Rapids Historic Landmark. Glance at the Past shares the story of the Playground Association of Grand Rapids. Grand Rapids artist Gert VanHouten became a well known WWI cartoonist publishing under the byline 'GERT'.